Happy Wednesday everyone! We're half way through the week already and the BIG move happens tomorrow. My entire life is in boxes right now. 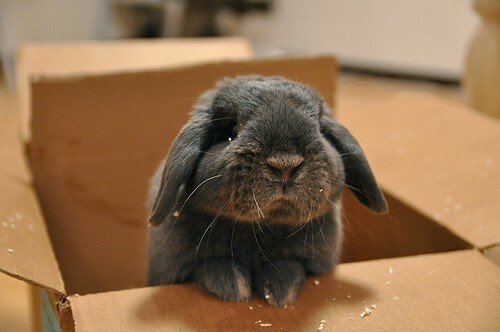 I feel like that cute bunny in box. I have no internet at my house right now so you won't hear from me until probably Friday or Saturday, but I have so much planned for future posts and Live.Love.Random will be getting a makeover. I see so many talented bloggers out there that do custom blog layouts that I'm having a hard time picking one! Do any of out there have any suggestions? You would think taking one themed picture a day wouldn't be so challenging, but some days I'm running around thinking "What was the theme? Oh yea! something new!" Of course everyone in the house thinks I'm silly. But anyway, the rest of this week is going to be crazy (I say that a lot don't I) and I'm going to feel so out of the "social network" loop. Thank goodness for my iPhone otherwise moving out to the country would feel like the twilight zone for me. I still can't get over the fact that I no longer have to worry about the halfway house that was across the street, but new worry is bears...lol...I'll take bears any day!